Part of the reason we were able to prevail, (see the last quote in the story), was due to the fact that the three owners of Louie’s Backyard were gutsy enough to back my wild notions. One of them, Ms. Pat Tenney passed away this week at the too young age of 66. We had our bouts back then she and I but Pat gave her all to making sure Louie’s paid the bills and kept on getting prettier each passing year. There will be a memorial for her soon and I hope to be back for it. As soon as I was nineteen, old enough to do what I wanted, I hitched down to South Florida. Oh, there were a couple of detours along the way — a moment of college in Hawaii, a bit of manual labor in Colorado and Kansas, work as a short-order cook in an Illinois diner — before I made my way to Key West and settled into cooking as a vocation for good. It was the early Seventies, and I was exposed daily to the cuisines of the Caribbean and Latin America, which soon became, after my mother’s lasting influence, the other culinary influence in my life as a chef. When I eventually decided to become a professional chef, however, I naturally gravitated to classic French cuisine — that was what one did. Back in the Seventies regional American cooking had few proponents. (It would be ten years before Alice Waters and Paul Prudhomme kindled that fire.) While I didn’t have the money to attend cooking school I did have the will to teach myself. One by one I bought the books that would form the foundation of my education. I read them like a jailhouse lawyer, sensing they were my only hope of escaping the rough lives of the cooks I encountered during the wild and wooly days and nights in the first kitchens I knew. Originally, I was deeply influenced by France’s “three-star chefs” — Roger Vergé, Alain Chapel, Alain Senderens, the Troisgros brothers. Yet my day-to-day eating experience was of vibrant New World flavors — West Indian chutneys and Central American plantains, Bahamian conch salad and Cuban steak a la parrilla — in the cafés and open-air market stalls of Old Key West. Slowly but surely the magic of those foods and their special language came to define me as a chef. There was, in fact, a defining moment in my decision to become the chef that I am today; it was one morning in 1987, as I sat on the deck behind Louie’s Backyard. At this point I’d cooked in a lot of joints, and I use that word purposefully. I’d been frying eggs and barbecuing ribs even as I was venturing into the Cuban and Bahamian shacks and cafés around Key West for lunch or a cafe con leche. By the Eighties I had become a chef and I was running Louie’s, long considered one of the best restaurants in Key West. 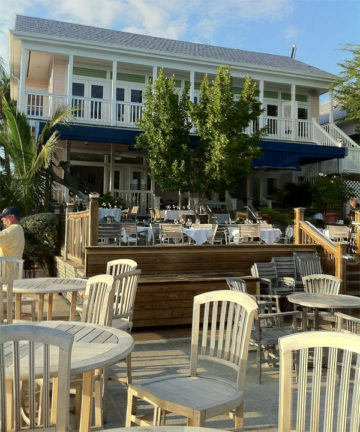 Louie’s is situated where the Gulf of Mexico meets the Atlantic Ocean. I was studying a stack of cookbooks — French, Middle Eastern, Southwestern, Italian — in pursuit of dishes for my menus, when I looked up to see a sailboat drifting southward. I too drifted with it for some time, wondering where it might be going and what the sailors would see, touch, and taste when they got there. And just like that, I realized that it was time for me to put away my books on the dishes of other places. It was one of those moments of complete clarity: As much as I had drawn from the wisdom and artistry of hundreds of years of European cuisine, it was now time for me to express where and what I was living, and that was Florida. South Florida, in particular. I thought about how North America’s music had evolved, how its literature and architecture and dance were amalgamations of cultures bumping up against one another. Key West was a place where Spanish, African, and Anglo influences converged, yet the foods we were eating (including at my own restaurant) seemed almost frozen in time. No one had yet imagined what kind of fusion cuisine — a phrase I coined — might result if those cultures were expressed in food the way the cuisines of New Orleans, California, and the American Southwest were the gastronomical expressions of those who inhabited these places. Latin America and the Caribbean too are guided culinarily by a vast range of histories and cultural influences — and an ever-shifting present tense. And like us, they take great pride in their differences. Perhaps the biggest revelation for me in writing this book was learning first-hand just how significant a role food plays in every culture. My moment of clarity then became one of resolve. I closed up my books and put away my notes. The sailboat was beyond the horizon now. I could feel Cuba just 90 miles away. The answer had been around me all along. I ate it and drank it almost every day. My new teachers were going to be in the cafés and homes of South Florida, not in the books of France. In next the weeks and months I went back to some of the same joints I’d eaten in many times since I had settled in Key West in 1973. I went to a restaurant called B’s and another called La Lechonera, to El Cacique and some places that had no names at all. I sat on stools at counters and ordered the Cuban-Bahamian fare. I pestered cops and fishermen and house painters and housewives about what they were having. Often I asked them if they wouldn’t mind translating a menu item for me. I earned the suspicion of many a waitress as I quizzed them and took notes on a little spiral pad. It got very exciting — I felt like I was cracking a case or solving a puzzle. I envisioned how each meal was cooked and how I would adapt it to the dishes I loved from my own life experiences. That was then, and we not only survived, but in the words of William Faulkner: we prevailed.